When you go into vacation mode, make sure it’s for one meal — not an entire season. Most of us think about putting on more padding during the winter months, when the holidays hit us with extra goodies from Halloween through New Year’s Day. Plus, those dark, dreary winter days can take a toll on workouts, and bulky sweaters and puffy coats provide good cover for cozying up to comfort food a little too often. But truth be told, summer takes a toll on our waistlines, too. It may seem strange considering we spend more time outside and farmer’s markets are bursting with seasonal produce, but summer comes with its own landmines to navigate. A typical weekend could take you from your kid’s soccer game (where you grab breakfast at the concession stand), to a BBQ where hot dogs and hamburgers are the main course, to the ice cream shop where you treat your kids — and yourself — to a cone. Suddenly a summer Saturday filled with fun outdoor activities has introduced hundreds of calories into your diet that you otherwise wouldn’t have eaten. Here are seven reasons your clothes might feel a little more snug this season, and the healthy habits to help navigate the menu and stick to your pre-summer weight. I love summer vibes! Things slow down a bit in general, and work weeks may be shortened — ending on a Thursday, beginning on a Tuesday, or both. Though relaxing and taking time off are critical parts of an overall wellness routine, it probably comes as no surprise that being constantly on vacation or weekend mode can cause the pounds to creep up. It’s nice to feel easy-breezy, but applying that “vacation mode” mentality to your diet or activity levels isn’t advisable. A small mental shift can help you enjoy the best of both worlds: Focus on balance. This will allow you to enjoy the ease of summer without relaxing too much on your fitness and healthy eating routine. Since the days are longer, take a stroll later in the evening or push dinner back an hour so you can go for a swim beforehand. Take comfortable shoes on vacation so you can see as much as possible on foot. When it comes to healthy eating, consistency is your friend. Stick to your routine as much as possible, and by all means, take advantage of all of those fresh fruits and vegetables available to you! Watermelon, corn and beefsteak tomatoes won’t be available when the weather starts to chill, so eat ‘em while you can. When the heat and humidity are brutal, you need extra sips. But for most people who aren’t killing it during their workouts (myself included), water is the best way to rehydrate. “Generally, only sweaty and lengthy activities call for sports drinks. For activities that last an hour or less that don't work up a sweat, plain water is your best bet,” according to New York Yankees and New York Nets nutritionist, Cynthia Sass, MPH, RD, CSSD. “If you're exercising for over 90 minutes, you're sweating heavily, or if your activity is short, but it's particularly hot and humid, a sports drink is probably a better choice,” she says. Note which category you fall into and replenish responsibly. Beyond sports drinks, other sweet beverages are some of summer’s worst offenders. Stop for a peach iced tea and you might be adding almost 300 calories to your daily total. And that freshly squeezed juice that costs as much as the minimum wage isn’t much better. Sure, the 200 calories come with a side of antioxidants, but your brain doesn’t compute liquid calories the same way it does solid ones, so if you’re making this a habit, there’s a good chance it’ll show up on the scale. Smoothies may be healthy, but if they have too many add-ins or contain sorbet or frozen yogurt (as they may at chains, like Smoothie King) they aren’t going to do your waistline any favors, either. Speaking of liquid calories, you might have to re-think your adult drinks, too. If you like pina coladas, you might like to know that one could have 450 calories. Even a tame-sounding vodka with cranberry juice can have close to 200 calories. Sangria is somewhere in between, and a frozen margarita can have more calories than a scoop of ice cream. I think you can see where this is heading. Your calories are better spent on foods that are filling, satisfying and nourishing. With this in mind, stick with beer, wine (including sparkling varieties), or something like vodka with seltzer and skip those summery cocktails. A survey from Weight Watchers showed that the average Brit eats about 3,200 calories at a barbecue. It’s easy to see how Americans would consume similar amounts. Between the mayo-based salads, hot dogs, hamburgers, ribs, chips and dip, lemonade and other sugary drinks, pies, brownies, and ice cream sandwiches, a barbecue is basically a healthy eating nightmare. If there are several barbecues on your summer schedule, consider creating a signature, better-for-you dish to bring. Your hosts will appreciate the help, and it will take the food situation up several notches. Apart from that, go for a portioned approach. Have one small-ish main dish (and challenge yourself to skip the white bun), and seek out simple veggie sides (like a piece of corn or a tomato salad). With a barbecue, healthy-ish is the way to go! Blame the funnel cake. And the cotton candy. And the fried Oreos. But sausage and peppers, gyros, pizza, and other carnival eats aren’t exactly off the hook. 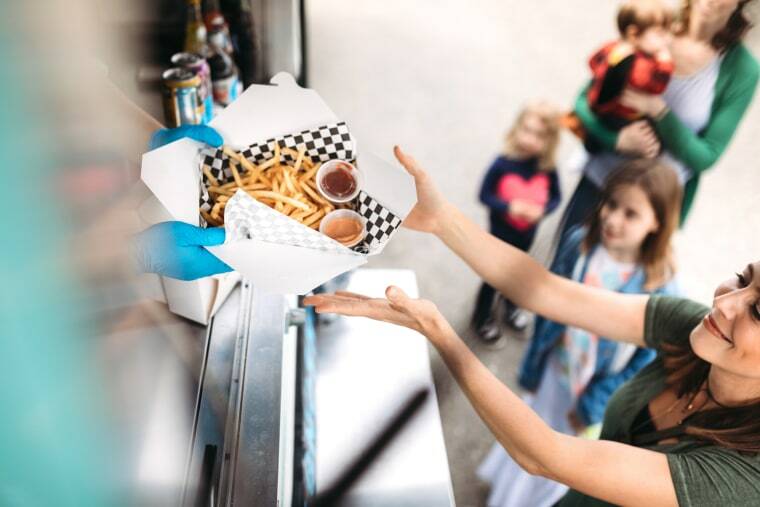 It’s hard to eat well at a carnival so if it isn’t an all-day outing, you might want to grab a bite before or after and focus on the activities while you’re there. After all, isn’t that why you’re at the carnival? If that won’t do, consider a kebab with grilled meats and veggies, along with some grilled corn on the cob. Or you could share a meal with your carnival companion. I know the call of the curly fries is real, but if you want to head into fall with your pre-summer body, it’s probably best to limit the fries, nachos, chicken fingers, and other boardwalk food. Instead, pack a picnic. You might enjoy sandwiches made with whole-grain bread, a summery fruit salad or corn salad, or a crudité with dips, like guacamole and hummus. Remember to fill your cooler with ice packs to keep your food safe. I love ice cream as much as the next person, but if the ice cream jingle gets you every time, you probably need a new strategy. Eating well means nourishing your body most of the time, while also allowing yourself to enjoy all the foods sometimes. Rather than stopping at the ice cream truck as it makes its way around your neighborhood every day, find a local ice cream parlor that makes homemade licks. Get a small scoop or cone, and sit back to enjoy it — not every day, but every so often. When treats are 110 percent worth it — the taste, the experience — they’re more enjoyable, and you might find you can get by with them a little less frequently. The truth is, this goes for all the food experiences mentioned here. The trouble comes when we regularly abandon our routine. When you go into vacation mode, make sure it’s for one meal rather than one season.